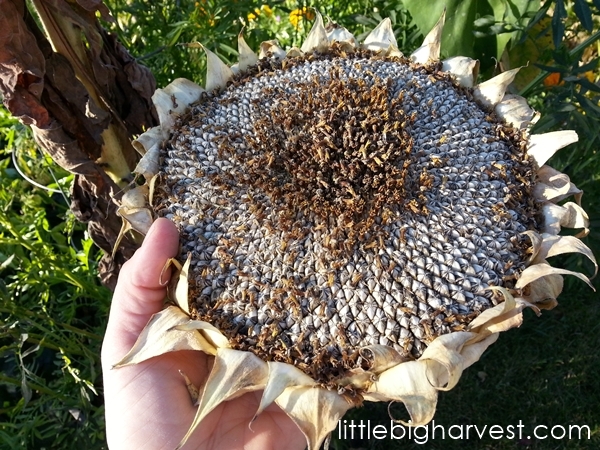 This was the ONLY sunflower head left for us. The chipmunks and squirrels had parties every night. They'd cut the entire head off the plant, drag it into the yard, and in the morning we'd find the scattered remains of the sunflower head massacres. I cut this head off--the only head left out of dozens from the summer--and let it dry a couple of days. Then Noah and I simply tore out all the seeds. It was a fun activity for mom and son---and provided more than enough seeds for me and my entire neighborhood to have sunflowers next year. I guess we could eat some of the seeds if we wanted. Or share some of the extra with the birds and squirrels. We'll see...I'm not particularly pleased with the critters and all the damage they did this year. I tried several new varieties this year from Baker Creek; topaz, tigerella, black icicle, and green zebra. I wasn't overly impressed with any of them except the black icicle--I fell in love with that variety (post coming soon all about it!). A neighbor kid (one that I'm super fond of because he always takes a keen interest in the garden) loved the tigerellas, so I'll probably end up growing them next year, too. Of course I will always save seed from my beloved, enduring favorite, Amish Paste. I had given away or grown every last saved Amish paste seed during the spring, so I had to make certain to save plenty of new ones. There was a surprise tomato, which I named 'mystery'. It seems to have grown from what was supposed to be a topaz tomato, yet looked nothing like any of the tomatoes I was trying out. It was a compact Roma tomato that had a really good flavor, so I decided to save seeds and see what I get from it next year. Another variety I saved; Roma Italia. This one was given to me by a garden friend, and though it didn't do very well for me, I think that had more to do with poor soil conditions. I want to give it another shot next year. Just writing about all my tomatoes makes me happy and filled with hope for next year! 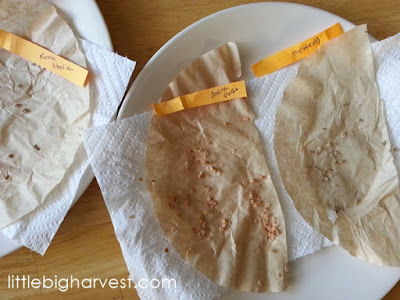 Here's my tutorial on saving tomato seeds if you've been wanting to try it! I grew at least 6 varieties. A garden friend sent me seeds for Red Chinese Noodle and Dragon Tongue beans...both of which I fell in love with. I grew yellow wax beans (another top favorite) and then a few different types of green bush beans. 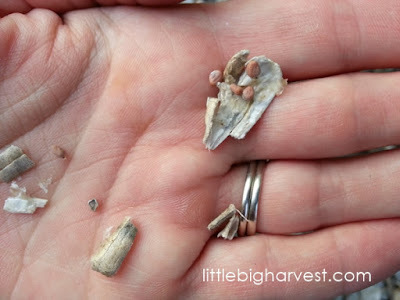 Now, when it came time to save seeds from the dried out pods left in the garden, I couldn't quite remember which of the bush bean plants were which. (The Dragon tongues and Red Chinese noodles were obvious, the others, not so much). The labels had long faded. 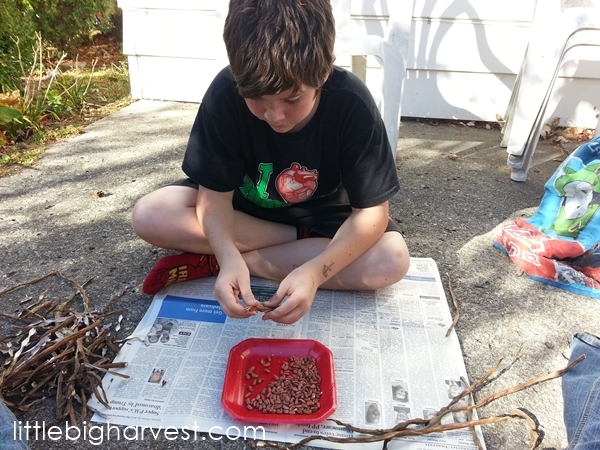 I remember planting the beans and labeling them, and being intrigued by the way each of the bean seeds looked different from one another--some white, some black, some brown and speckled--but I couldn't remember which seeds went which bean. No matter, I saved and sorted them all, along with Simon. An internet search revealed that the black seeds were probably yellow wax, so those I labelled in their envelope; the rest will be a mystery until we grow them next year! I will never ever have to buy marigold seeds again. First of all, they reseed themselves like crazy. Second, you can save a few of the deadheads and have hundreds of seeds to scatter and share as you please. I'm not sure instructions are needed, but here is my marigold seed post--take a look if you are curious about why I'm utterly in love with marigolds, when I used to think they were useless. Let me preface this. I am not sure I've done it correctly. I remember reading somewhere that radish seeds require special sequestering of the plants and so forth. But hey...I unintentionally let one of the spring radish grow instead of eating it, saw the single radish plant flower profusely and then produce dozens of these pods, and I was utterly fascinated. I ate some of the pods after a Facebook friend suggested it; YUM! Then I let most of the pods go. They dried out, and the kids and I opened them up to find seeds. This was a very exciting discovery for us! Though getting the seeds out of these pods is actually a bit labor intensive, we were able to a good amount (at least two seed-packets worth) and will definitely try growing the seeds in the spring. Fingers crossed we have success! I love cilantro. LOVE it. Getting it to grow and thrive has taken some trial and error (finding just the right spot is key), and I have found it goes to seed way too easily, before I want it to. Instead of feeling sad that yet another cilantro plant went to flower and seed before I was ready to stop eating it, I saved a ton of the seeds. I did this last year, too, and the seeds were viable. I love having tons of cilantro seeds (techincally, in seed form it becomes coriander, and I suppose I could use it in cooking as such, but I don't have a lot of recipes that call for coriander). Let the cilantro trial-and-error continue next year--I have more than enough seeds with which to practice! Much like the radishes, these greens grow beautiful flowers and then seed pods (bok choy in the photo above). I find this so fascinating! 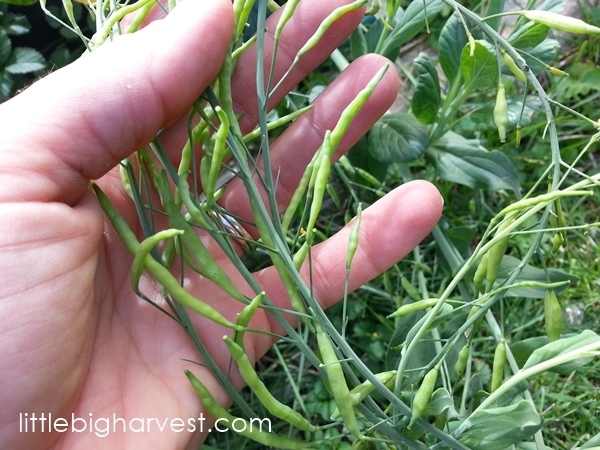 After the green pods dried out, we peeled some of them open and saved plenty of seeds. This is new to me. Patrick and I spent some time in the gardens of Young Urban Homesteaders recently, helping prepare the garlic beds. Samantha cut out some of the dried flowers from her Water Leeks (the flowers were filled with tiny black seeds) and sent them home with me. Apparently they grow tender blades of garlicky-oniony leaves, and I think they will be a great fit somewhere in the garden next year! They appear to go by the name Flowering Chinese Leek, too. I love the ease of growing garlic! Young Urban Homesteaders sent me home with garlic to plant, which we put into the ground at the beginning of November. 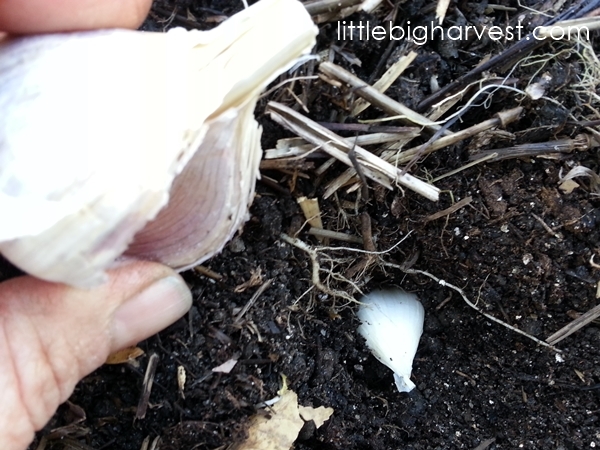 I had saved some of my own garlic, too, so I planted both varieties. Mine were hardneck (you can tell by the hard stem going through the center) and the bulbs from YUH appeared to be softneck. We'll be harvesting the new garlic heads next July or August. I was so thrilled to have success with sweet potatoes this year, grown from the sprouts off one of Uncle Loren's giant spuds he shared with me last fall. I will be saving one of my fattest sweet potatoes and letting it sprout through the winter in order to start my own sweet potato cycle. Uncle Loren's been growing this line for many years (if I remember correctly, he told me they are Georgia Jet). It's magical to me that a whole new harvest is created each year from just a couple of the potatoes that grew the year before, and that in a way, potatoes and sweet potatoes are one long line of clones. 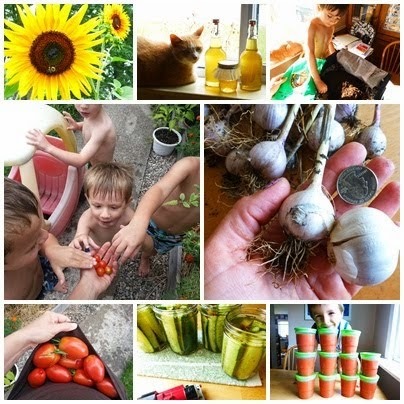 What seeds did you save this year? Please let me know in the comments! You have a huge variety of vegetables and seeds to choose from! Do you use them to plant new flowers or to sell them and can i know is there a way to dry them up? This is what a blog post should be; appealing, organized and interested. The outlook is brilliant with stunning pictures and the activity of seed saving is quite a noble indulgence to consider.